Bornholm is also called the “Pearl of the Baltic Sea” – because of its shiny white sandy beaches, because of its rough cliffs in the north, because of its cosy and picturesque small fishing villages, the unique and unspoiled nature, the high quality gourmet food, the rich outdoor sports possibilities, the famous arts and crafts and much more. Bornholm inherits all of that and much more – the island in the middle of the Southern Baltic Sea is a perfect destination for cruise ships. Harbour facilities are good in the towns of Rønne, Svaneke, Gudhjem as well as the tiny islands Christiansø and Frederiksø. When you visit the towns and the island itself, the locals are friendly and welcome you. Often you can experience the towns on your own or use a local guide service – either by bike, coach or by simply walking through the old town. Bornholm is an island located in the Baltic Sea, right between Sweden, Poland and Germany. In the northern part of bornholm, the coastline is mainly rocky and in places very steep, but to the south it has white “tropical” beaches. Bornholm has also more sunshine, than the rest of Denmark. Therefore it is also called “the sunshine island”. Bornholm covers an area of 588 km2 (227 sq mi) and has 40.000 inhabitants, the capital of Rønne has 14.000 inhabitants. The currency is Danish Kroner, but the Euro and all other major currencies and credit cards are also widely accepted. The history of Bornholm is a turbulant one with many nations having ruled. There is a rich medieval heritage on Bornholm, with churches and castles dating back to 1100-1200 AC. Farming and fishing has historically been the main industries, but tourisme, which began in the early 1900, is now the 2nd largest industry with 2.000 people employed. Busses and taxis are well regulated in Bornholm, and it is both safe and easy to get around on bicycle, however one must take the hills into consideration. The local food heritage is important in Bornholm, and a revival through the last 15 years has brought a Michelin star to a local restaurant, and spawned a number of high end restaurants and many new local producers of quality foods. Several of Bornholms beautiful towns are popular destinations for cruise ships. Get your guide to the towns' ports, facilities and other services by clicking on the images. What ever means of transportation you might ask for - possibilities are many. There are several bus operators in order to take you around on the island, you can rent bikes at many places or you could also use public transportation with a dayticket. Your guide to transportation on Bornholm is right below. Bornholms Tourist Information has offices in seven towns: You'll find our friendly colleagues in Allinge, Gudhjem, Hasle, Nexø, Rønne, Svaneke and Aakirkeby - and even the little island of Christiansø has a tourist information in the "Lighuset"-building (the former morgue). 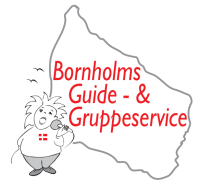 Make the most of your holiday on Bornholm with our official travel guide app. Please take the time to explore our entire website here. If you are an agent or cruise line and you wish to inquire about a future call in Rønne or Bornholm, please feel free to contact one of the Cruise Bornholm Network partners below.